They’re known as the haenyeo, or sea women. 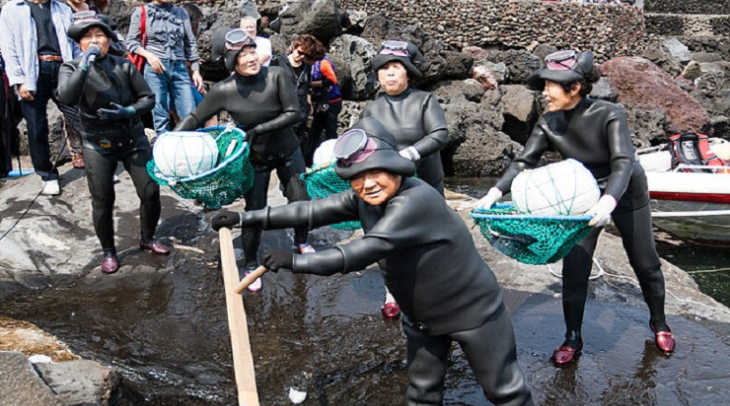 For centuries, the women of the South Korean island of Jeju have helped support their families and communities by diving to the bottom of the sea, holding their breath for up to two minutes, to catch and collect all kinds of seafood. They’re known as the haenyeo, or sea women, and a generation ago there were tends of thousands of them. Today, their numbers are in the hundreds and they’re mostly in their 60s or even older. Reporter Jason Strother has this report from the island. Waves crash against the black volcanic rocks that line this stretch of Jeju Island’s north coast. Its windy and has been raining off an on since I came here – not unusual weather. Kang Ok-ja looks out toward the ocean from the roadside. It’s not a good day for diving, she tells me. The 75-year-old knows the sea better than most people. She’s a haenyeo, a sea woman, and has been diving in these waters since she was a teenager. It was a kind of family tradition for her. When Kang started, there were around 40 haenyeo in this neighborhood. Now, including her, there are only 3. The trio dives together whenever they can. They swim out about 40-meters into the ocean and with the help of 3 to 5 kilo weights, they descend 15 meters or so. They wear black, rubber wetsuits, goggles and flippers. The haenyeo shun air tanks. They also carry knives and other kitchen-like tools. Kang explains they come in handy on the seabed. Octopuses aren’t the only sea creatures that give haenyeo headaches. They’re cautious around dolphins because their dorsal fins could hurt them. But Kang says they have a, well, unique way to prevent that from happening. “We have a little spell we put on the dolphins. We repeat please roll over, please roll over. We say it and they flip over. They don’t want to hurt us,” she says. Diving also poses some serious health risks, too. Kang underwent back surgery due to all the strain and can’t hear out of her right ear from the pressure changes. But she says she never thought the job was dangerous until 15-years ago. The danger of diving to the sea floor is one reason why Jeju’s young women don’t want to follow in the footsteps of their haenyeo mothers and grandmothers. But as this tradition fades away from the island, some Korean women are now seeing the divers as heroes. Like 32-year-old Kwon Min-jin, who moved to the island from Seoul a couple years ago and is haenyeo Kang Ok-ja’s neighbor. Kwon actually enrolled at a diving school run by haenyeo and learned how to catch seafood like them. She says learning to breathe like them was more difficult. “Like [breathes] like this between lips, like really long, no _cough_, if you really hold your breath over one minute it sounds like a dolphin [breathes] like this,” she says, mimicking the sound. Kwon is not giving up her real job to become a haenyeo. She says diving is just a hobby and she goes underwater to mostly pick up trash. But on Jeju’s east coast, a community of 300 haenyeo are busy collecting and cooking their seafood catch. The women of the Seopji Haenyeo House work on 22 day shifts. They rotate diving, cooking and waiting tables. In one corner of the restaurant, tanks are filled with sea cucumbers, conches and some kind of spikey shellfish. In the kitchen, I watch a pan of conches become engulfed in flames. Staff here say that a couple decades ago, abalone was the most popular and pricey dish. But, these days it’s almost impossible to find any on the seabed. Environmental damage is one reason, but haenyeo Lee Sun-duk says divers share the blame. A vanishing catch is another reason the haenyeo tradition is dying, too. But the Jeju government is trying to help preserve it. It’s applied for UNESCO world heritage status and promotes a haenyeo diving show for tourists. Several women jump into a seaside lagoon. They emerge minutes later with baskets of shellfish. The women then sing a little song for the onlookers. The haenyeo show might not be the real thing, but at least it’s keeping with the spirit of the island’s tradition.